Sleep apnea is a medical condition that is related to snoring. When you snore, your airway is restricted so that the soft tissues in the back of your throat vibrate. With sleep apnea, there is a complete blockage of your airway, causing you to stop breathing momentarily. The lack of oxygen can cause you to wake up briefly, and then you fall back asleep, usually without remembering that you woke up. This can happen many times throughout the night, leaving you feeling exhausted during day even though you believe you got a full night’s sleep. Unfortunately, this condition is frequently undiagnosed and can lead to serious health problems, such as high blood pressure and strokes. 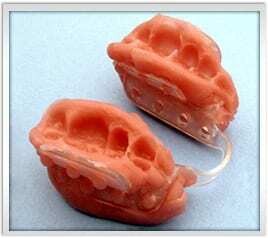 At Burba Dental we use Snore Guard. It is a small intra-oral device that you use only during sleep. The unit will be custom fit to your mouth so it is very comfortable. Snore Guard fits snugly over your top teeth while you sleep and keeps your lower jaw in a natural forward position in order to keep your airway open. It can eliminate snoring or mild to moderate cases of sleep apnea. You and your partner will finally enjoy a restful night’s sleep. Another treatment option for Sleep Apnea is the “Silent Sleep” device. This is custom fit to your mouth. The bite trays are soft and flexible. It’s had success as an alternative to those who hate the CPAP Machine. It helps with snoring, sleep apnea, and bruxism. The comfortable fit can give you a restful night sleep, without all the bulk and noise of a CPAP. If you suspect you may have sleep apnea, visit our request an appointment page or call and make an appointment. You are welcome to request a complimentary consultation for a few minutes if you just have some questions for the doctor.